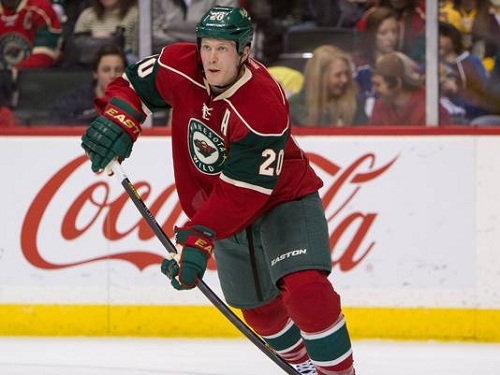 Last Night’s Minnesota Wild VS Nashville Predators game marked the first time that Wild free agent signee Ryan Suter faced his former team. So without further ado, let’s get to the game. 7:07- Puck Drops on the Wild’s third game of the season. 7:09- Anthony Lapanta, the Wild’s TV play-by play guy, is absolutely horrendous at his job. His voice puts me to sleep. And his play-by-play style is as boring as going to a Minnesota Lynx game. Something, I can say with pride, that I’ve never done before. 7:11- Fight!! Zenon Konopka, who has a broken nose, tussles with Richard Clune. This is Konopka’s second fight in three games with Minnesota. I like the grit he brings to the Wild. Neither guy is able to connect with any big blows. 7:16- The Wild has brought a consistent forecheck to this game so far. 7:18- Wild goal! Dany Heatley shoots from the point and the puck is deflected in off Kevin Klein’s glove into the back of the Nashville net. Zach Parise is credited with the goal. Apparently, he also deflected the puck in front of the net. Either way, it’s a Wild goal. 7:21- This is the best the Wild have looked this season. By far. They have had a consistent forecheck going throughout the whole of this game so far. This is the first time they have had that this season. 7:23- Backstrom with a huge save off a Mike Fisher re-direction in front of the net, as he was getting run over by one of his own defenders. Nice. 7:28- Penalty on Nashville- Nick Spaling goes for tripping. Let’s see if the Wild can continue their hot start on the power play. 7:30- Good pressure on the power play so far for the Wild. But Predators goalie Chris Mason has made a couple of nice saves to keep the Wild off the board. 7:32- Mike Fisher with a diving poke-check to keep Mikael Granlund from having a breakaway. Great play by Fisher. 7:33- This game has a much better flow than the Wild’s previous game against Dallas. The Dallas game, in all honesty, was a snooze fest. Again, Lapanta’s terrible play-by-play didn’t do that game any favors. 7:36- Nate Prosser takes his turn at the sprawling poke-check and succeeds. As he spoils a breakaway chance for Nashville’s Gabriel Bourque. 7:39- Goal! Nashville scores. Nick Spaling scores on a rebound chance in front of the net. The game is now even, 1-1. The assists go to Brandon Yip, and Kevin Klein. 7:40- Nashville is bringing it to the Wild now. This game has been a solid back and forth affair. 7.44- Period ends with the score tied 1-1. Enjoyable game to watch so far. ST PAUL, MN – JANUARY 22: Clayton Stoner #4 of the Minnesota Wild checks Mike Fisher #12 of the Nashville Predators during the first period of the game on January 22, 2013 at Xcel Energy Center in St Paul, Minnesota. Parise is a grinder. He is constantly battling for the puck and never gives up on a play. He definitely gives his all every game. Barry Trotz, Nashville’s head coach, is one of the best in the league. Despite having a small payroll, he consistently finds away to keep his team in the thick of the Western Conference Playoff race. The Wild needs to keep playing hard. Nashville is playing it’s second game in as many nights and should get fatigued as the game goes along. Especially, if the Wild can continue to press them like they did during the first 15-minutes of the first period. It’s time to move Pierre-Marc Bouchard up to the second line to replace Matt Cullen. Bouchard has the offensive skill to play with Mikael Granlund and Devin Setoguchi, while Cullen is more of a defensively orientated player who would work well on the third line. The Wild needs to generate more offense in five-on-five- situations, and this would be one way to do that. 8:04- Puck drops to begin the second period. 8:06- Nick Spaling of the Nashville Predators has been all over the ice tonight. Impressive player for Nashville. 8:07- Parise with a solid slap shot that is stopped by Mason. 8:08- The Wild’s fourth line with a great shift. They controlled the puck in the Nashville zone for the whole of their time on the ice, and were able to get a few chances on goal. 8:09- Check that. Darroll Powe takes a penalty at the end of his previously impressive shift. 8:11- Parise draws a penalty and is denied on a glorious chance in front of the net. Mikko Koivu set him up. 4-on-4 action now. Nashville’s best player, Shea Weber, goes off for the penalty. 8:13 Heatley has brought his “A” game tonight; great pass by him to set-up Tom Gilbert for a splendid scoring chance. Gilbert then tries to make an ill-advised extra pass when he was all alone, which results in a turnover. 8:18- Backstrom stones Martin Erat in front of the net. Another nice save from Backstrom. He looks more in control this game. 8:20- Penalty on the Wild! Justin Falk goes off for interference. Nashville with the power play. 8:21- Wild defenseman Clayton Stoner with a huge hit on the penalty kill. Meanwhile, Backstrom with another nice save on, I believe, Martin Erat. 8:24- The Predators have out-played the Wild so far in this period. 8:26- Koivu is stopped on a two-on-one with Parise, by Chris Mason. I’m Glad to see he shot the puck there instead of making the difficult pass attempt over to Parise. That’s the one thing about Koivu’s game he needs to improve: shooting the puck. He has a solid shot, but too often, he tries making the difficult pass over letting it rip. 8:36- Call me a homer, but I think the Wild has the hardest working first line in the NHL. They never give up on the play and are constantly battling. It’s a great thing when your best players are also your hardest workers as It forces everyone on the team to work just as hard as they are. Because if the best players on your team are busting it, you better be as well. 8:39- Penalty on Nashville! Brandon Yip goes off for Roughing. He argues the call but he clearly punched/forearmed the Wild’s Jared Spurgeon. 8:41- Second period ends with the score still tied at 1-1. The Nashville Predators controlled the play in the second period. They had the better scoring chances and seemed to have the puck more in the offensive zone. The game has gone about the way you would expect between these two teams; tight-checking, defensive, and neither team making any glaring mistakes. Nashville plays such a solid, patient, and defensive orientated game. They remind of the early-to-mid-2000- Minnesota Wild teams under Jacques Lemaire; very defensively sound with few mistakes. Minnesota needs to get the puck deep into Nashville’s zone more. With Nashville playing its second game in as many nights, the Wild need to make them work. Because, you have to figure, the Predators will likely run out of gas here in the third period. 9:00- Puck drops on the third period. The Wild begins the period on the power play. 9:00- Update: The Wild goal has been changed from Parise to Heatley. 9:01- Matt Cullen is stoned by Mason on a wrap around attempt. 9:02- Cal Clutterbuck lays out Hal Gill with a hard hit. Gill, a giant on the ice, is not an easy man to take down with a clean check. 9:05- Zach Parise shows off some great hand-eye coordination as he catches a pass out of mid-air with his stick at center ice. 9:06- Clutterbuck lays out another Predator behind the Nashville net. Moments later, he decks a Predator at center ice. Great sequence for Clutterbuck there. 9:07- Granlund shoots wide on a backhand attempt in front of the net. The puck came to him off of a crazy carom from behind the Nashville net. 9:14- Penalty! Coincidental minors. Patric Hornqvist goes off for Nashville- goaltender interference. Clutterbuck goes off for the Wild- hooking. 4-on-4 action for the third time tonight. 9:17- Clutterbuck has been all over the rink for the Wild this period. He has, by far, been the best player on the ice for either team this season. 9:18- Nashville is showing signs of fatigue lately. The Wild need to capitalize on that in the final 10 minutes of the game. 9:21- Goal! Predators! Crazy play leads to the Nashville goal: Loose puck at center ice trickles down towards the Wild net and Backstrom leaves his net to play the puck at the top of the circles, but Martin Erat beats him to it, and slides the puck into the empty cage to give Nashville the 2-1 lead. Horrible play by Backstrom. As he was undecided on what to do, and left his cage too late to retrieve the puck. He either needs to let Erat have the partial breakaway there, or come out of his net sooner. 9:23- First time the Wild have been down in the third period of a game this season. Can they tie it up? It will be hard to do against Nashville, which has one of the best defensive teams in the league. 9:28- Heatley denied twice by Mason in front of the net. Including: once on a rebound attempt of his own shot. Good effort there by the “Heater”. Heatley has really played well in this game; showing some nice moves with the puck. 9:30- Granlund is showcasing his skill in this game. He has made a few plays in limited space that no one else on the Wild team could do. Sadly, no one has been able to take advantage of this for the Wild. 9:32- Minnesota’s top-line is buzzing right now. Mason robs Parise and Heatley on back-to-back chances. Koivu also had a great chance, but can not capitalize. Nashville is forced to ice the puck, again. Now, Nashville calls timeout. The Predators on the ice are gassed, and can’t leave because of the icing. 9:36- Backstrom robs Hjornqvist in front of the net to keep the game 2-1. Big save, as it keeps the Wild alive in this game. One minute left and the Wild goal is empty. 9:37- Penalty! Bouchard goes off for a slash with 25 seconds left. The face off will be down in Minnesota’s zone. Tough to come back now. Backstrom will have to come back into the net here for the face off. 9.38- Goal! Nashville scores on the power play as David Legwand fires one past Backstrom on a three-on-one opportunity. 3-1 Nashville. 9:39- Game over. Nashville wins 3-1, and hand the Wild their first loss of the young season. This was another evenly played period. Nashville was able to capitalize on a lucky bounce and a mistake by Backstrom to score the eventual game-winning goal. The Predators played another solid period in the third. Despite losing Ryan Suter, they still find a way to get the job done. Whenever I watch Nashville, I get flashbacks to watching the Wild under Jacques Lemaire. It may not be the most exciting hockey to watch, but it gets the job done. The Wild’s first line continues to excel and create good scoring chances. Once they start putting the puck into the net consistently, it will be hard to slow them down. Backstrom’s play on the game winning goal was horrendous. He had no shot of playing the puck before Erat and should have just stayed in his cage. Clutterbuck was a force in the third period. He was hitting everything on the ice, which is typical of his play. He is a joy to watch. The Wild drops its first game of the season. Of course, any loss in a shortened season is not a good thing. Yet, I thought this was the team’s most consistent performance to date. They caught a bad break in the third, which cost them the game. But they were in control of the game and had Nashville on the ropes until Backstrom wandered out his cage. If the Wild compete like they did last night, they will win more games than they lose this year. The Wild had a bit of a let down in the second period. But overall, they played a solid game and I was impressed with their effort and performance tonight. Once the goals start coming, and they will come, this team will be hard to beat.